. It's a great way to free up time to focus on just doing something for the sake of enjoyment. I recently also read this great article which shares why routine and creativity need to work in unison. Fantastic inspiration and insight which explores the routines of several very famous creative minds. In my world I fall into the same trap... work takes centre stage and the idea of creating just for fun can seem foreign. I have, however realised that by not re-fueling creatively I can't actually stay inspired. This goes beyond looking at Pinterest or pretty pictures - it gets back to basics and the enjoyment of using your hands to make. So off you go... get making! You need not spend hours a day away from you desk or to do list, but just do a little something that reminds you why you do what you love... there could be a brilliant idea just waiting to be uncovered. This little gift was truly a labour of love and it took ages to finish. It was one of those things that I would work on when I got a gap. It offered an escape slotted in between deadlines and emails, just a happy ten minutes now and again. I used an old watch that I found at a second-hand shop and removed the strap. Gold ribbon from Ebony & Ivory formed the base of the watch fob concept. 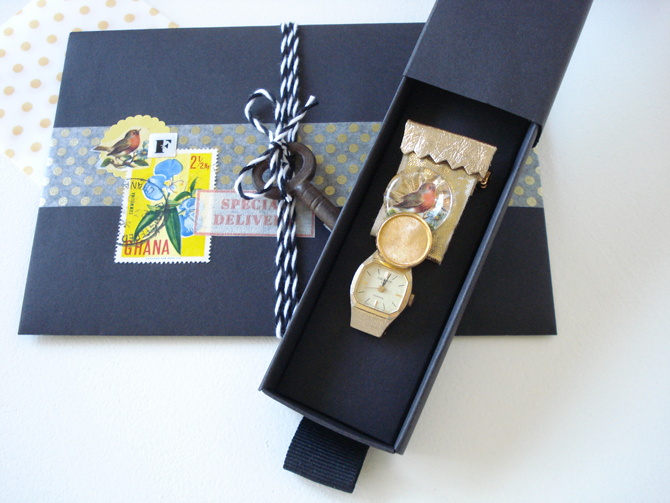 The buttons are vintage paired with bird washi tape, which I varnished onto the button so it would stay put. Lastly I sewed on a brooch back and then I finished it off with a strip of gold leather which folds over the back. The envelope is decorated to compliment the gift. Plenty of love and care went into this and I do hope that it's enjoyed and worn with pride. I hope to make more time for creating gifts and making, it gives my business orientated mind a little holiday leaving me refreshed and focused once more. 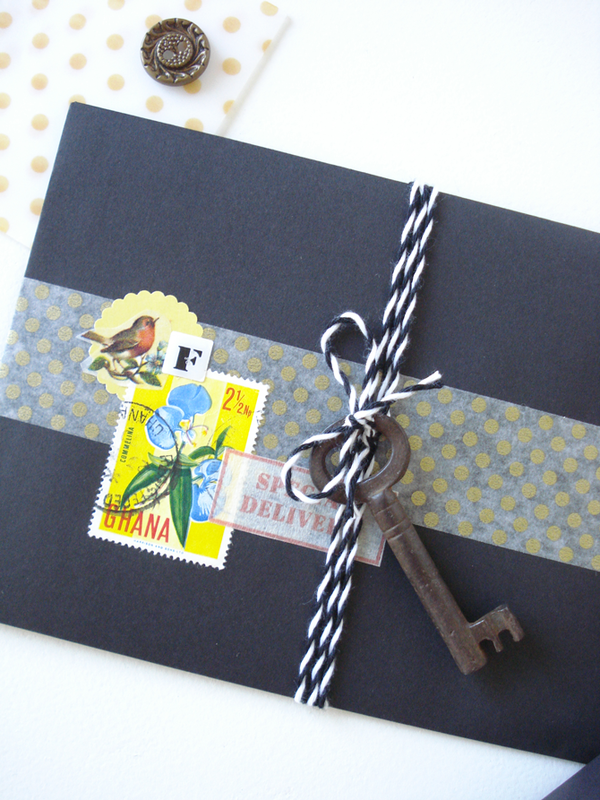 Beautiful creation, love the little key tied onto the envelope.